Red and blue would not have been my first choice for colors. However, the district had experimented with those colors for the branding on our Facebook page with relatively positive results. It was suggested that we incorporate them into the new logo, so those were the initial set of colors I tried. But they weren’t working. Blue is fine; I can work with blue all day (and I’ve been accused of using it far too often). But red just doesn’t work well in large doses outside of food advertisements and Christmas. It seems like one of the major culprits behind visual fatigue in design. There were other issues with the color. 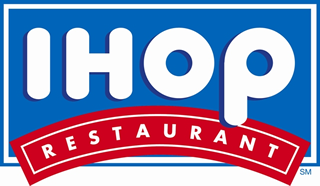 Our old logo was blue and yellow; switching to blue and red was not going to accomplish much in terms of advancing the current brand. 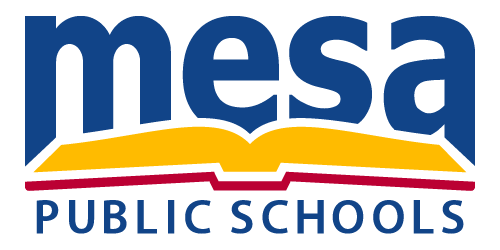 Worse yet, one of our high schools, Mountain View, uses red and blue for its school colors; a red and blue district logo was sure to conflict. In fact, this limited our two-color options considerably: one high school uses blue and orange; another purple and yellow. Finding an attractive two-color scheme not yet spoken for in the district was going to be difficult. Even different shades of blue and yellow were bound to step on toes. I knew it was going to be controversial, but a move to a three-color logo seemed like the best approach. By using blue, yellow and red, we could build on two district brands: the old logo, and the Facebook branding. And a three-color logo would be safe from conflicts across the district; our schools only have two-color palettes. Color wasn’t the only problem. The whole logo felt squished… The book, especially, felt as flat and lifeless as–well, a stack of buttermilk pancakes–and not nearly as appetizing. The visual flow between the lowercase letters (Myriad Pro, by the way) was very dissonant; the angle of the terminals were haphazard, as if they were channeling Comic Sans. And the relationship between the text and the book was very arbitrary and in need of strengthening. Swapping Myriad with Tahoma for the lowercase font. The terminals of the letters flow much better for logo use. Relaxing the geometry of the book–allowing the cover to bend down softly, and the pages to fan out more naturally. Allowing the letters to wrap around the upper and outer edges of the book. This created a sense of visual interactivity and a much stronger dynamic between the two elements. It was with the Mk. II that I knew I was really onto something special. I would guess about 90% of the final logo is in there. Then again, that last 10% was going to be crucial. Something I had long read about, but never had a serious opportunity to attempt, was the use of phi, the “golden ratio”, and Fibonacci proportions in logo design. It was at about this point in the design that I started wondering if my logo obeyed Fibonacci proportions in any respect. Sure, most formally trained designers probably begin with phi… I’m a slow learner, so sue me. I know, to some, this may seem like an insane, obsessive amount of detail placed in the relative proportions of the logo. On the other hand, this may seem half-baked to designers, lacking in fundamentals–I didn’t use incorporate the “golden spiral” anywhere; I did not use one-to-phi for the total dimensions of the logo. Still, I’ve got to believe that there is some truth to the benefit of Fibonacci proportions… In the months that our team has stared at this logo, we haven’t tired of it even the least bit. It’s only gotten stronger. Helen (Director of Communications) has since suggested that the use of phi and Fibonacci is one of the reasons it has maintained so well in this time, and I tend to agree. This was the design I brought when the branding team began to meet and evaluate our various concepts. Most of the time, “design” and “by committee” go together about as well as oil and vinegar, but that wasn’t the case with this group. This was a room full of brilliant, talented and passionate people with years of expertise in their own areas, all of which were extremely relevant to the tasks at hand. The print shop guys especially–Bill, Matt, and Benito–have seen our past and present logos used on thousands of documents and know all of the situations in which a logo might or might not perform well. There were so many suggestions made, I couldn’t even begin to list them all. We tried changing the width of the book’s spine, adding a curve to it, lowering the crease of the pages; adding serifs to the letters, adding flairs where the letters met the book at the edges, moving terminals closer together, farther apart. I could write a book called Fifty Shades of Yellow for all of the color variations we considered. Most of the suggestions never made the cut, but those that did were extremely important. I brought the team a rough, stone shape; they carved away at it, polished it, and found the masterpiece inside. We replaced Tahoma with a completely custom typeface: a monoline, geometric/humanist hybrid. We altered the color palette, making the blues and reds much deeper & richer, and bringing the yellow out of the school bus/pencil/cheddar cheese territory to a somewhat golden hue–much more pleasing to the eye. 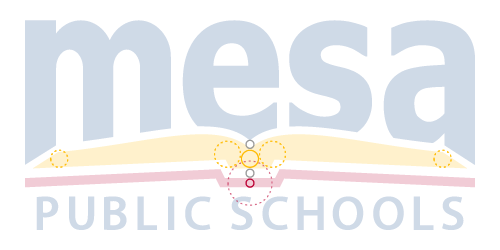 We realigned and redistributed the uppercase text of “Public Schools” to improve readability and reinforce the use of the golden ratio in the logo’s upper half. With a final design we were confident in, it soon became time to test its appeal and present the logo for approval… a process that would become one of the most unusual, but ultimately most rewarding, experiences of my career. 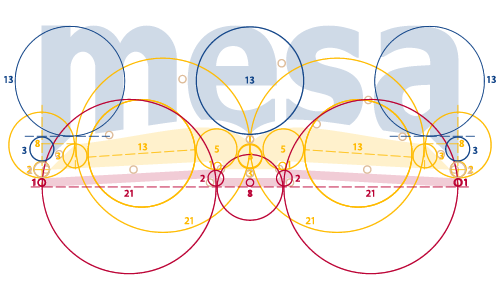 This entry was posted in At Work and tagged design, fibonacci, golden ratio, logo, mesa, mesa public schools, mps, phi. Bookmark the permalink.